Apple picking and pumpkin picking is such a fall activity to do in New England and there’s so many great farms to choose from! Originally written September, 2016 and Updated for 2017 and 2018 Apple Picking season. Train rides, farm animals, hay pyramid, farm maze, children caterpillar rides, weekend hayrides, apple & pumpkin picking, and more! Pick your own, wagon rides, playground, farm animals, pumpkin patch, and more! Pick your own apples and pumpkins, hayrides, tractor playground, barnyard animals, and more! Pick your own, hayrides, farm animals, pumpkin patch, hay play area, and more! Pick your own hours vary based on weather/conditions, get updated information here. Corn maze, barnyard animals, hayrides, grain train, live entertainment, haunted farm, pick your own, and much more! Farm animals, train displays, pick your own fruit, hayrides to the pumpkin patch, and more! The only organic apple farm I could find in the Greater Boston area is Old Frog Pond Farm in Harvard, MA but they are not doing Apple Picking this year due to poor crop. Please let me know in the comments below if I missed your favorite spot or if your favorite is on the list. 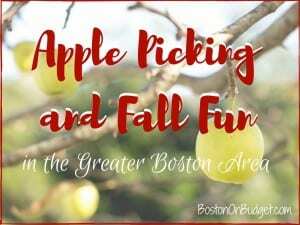 Where is your favorite place in the Greater Boston area for apple picking and fall fun?!? Set on a hill, in the fall or spring it is a beautiful spot. Stay shopping or a meal in the darling downtown afterwards!